Tomato & Avocado Egg Salad is a perfect combination of colorful and filling ingredients. It looks amazing and more refreshing on the bed of fresh green spinach leaves. 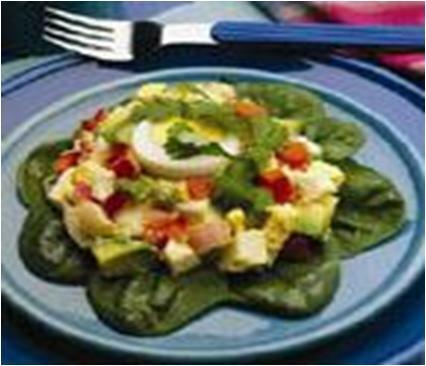 This Tomato and avocado egg salad is delightful as shown in the given picture. This unique salad is a rich source of protein, fiber, Vitamins and foliate etc. Egg and Spinach Salad is the simple version of this amazing dish. You can dish up the Tomato and Avocado Egg Salad to fill the hollowed-out tomatoes or simply as a sandwich filling on the crusty and fresh rolls. First make the dressing and leave it to marinate. Take a medium mixing bowl and shift the mayonnaise and sour cream into it. Drizzle the fresh lemon juice and and hot pepper sauce all over the cream mixture. Sprinkle the salt over the dressing and blend the mixture until smooth. Cover the dressing bowl and leave to marinate until you boil the eggs and prepare the salad. Now, boil the eggs perfectly. Once you peel the boiled eggs, just cut them into medium slices. Take a plate and place 6 center slices from eggs in it. Reserve them in refrigerator for later use as garnishing. Use a sharp knife to finely chop the remaining egg slices and place them in a large mixing bowl. Add in the chopped avocados, onion, tomato, and parsley. Toss this mixture to mix up the chopped ingredients. Pour the previously prepared mayonnaise-cream dressing and stir lightly until the salad's ingredients are evenly coated. Cover the salad's bowl with the help of a plastic wrapping sheet or simply place a plate on the top. Now, refrigerate it for at least 1 hour in order to provide the ingredients with ample time to marinate thoroughly. Right before dishing up the salad, arrange some fresh spinach leaves or lettuce leaves on a large serving platter. Take out the wrapped salad bowl from refrigerator, unseal it and spoon the salad into the center of the spinach or lettuce leaves. Remove the reserved boiled egg slices from fridge and arrange them all over the salad. Serve and enjoy.